Andrew Tamminga Art Director PFSP, Dylan Mitchell Volunteer PFSP, Kyle Little President PFSP and Tylor Maynard Volunteer PFSP. On a rainy morning nothing unusual for the Portage, Wisconsin Canal day weekend, some would say a tradition in Portage, Wisconsin the rain that is but this year proved to be one for the books. 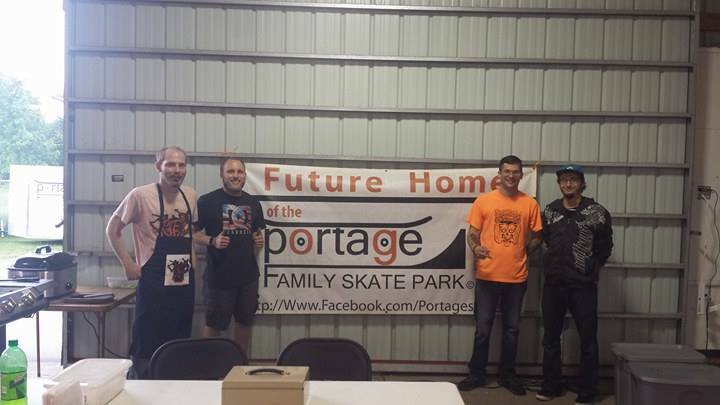 As the rain let up and the sun came out the Portage Family Skatepark committee and volunteers took to the grill inside the Bidwell building located at the Portage fairgrounds. A steady stream of thrifty buyers and those looking for the diamond in the ruff at this year’s Portage annual city flea market. Those that came through almost all had to stop and say thank you for what we have provided so fare with the first phase of the @portagesk8park. During this time we meet young and old supporters of all walks of life. We all told stories of past events and talked future plans. Many even commented this “I use to skate.” By 1:00 we were already headed in to get more brats and hotdogs to not only serve the guests but the many vendors as well. This year like every year the Portage Park and Recreation did a wonderful job filling up vendor locations and provided great marketing for the event. We are so thankful to be invited back each year. We now have set a milestone, as this year marks our 5th year as an organization working alongside the Parks department to bring the city yet another wonderful event. This year also marks the highest food sale and merchandise sale we have ever had at this event. We had many #pfsp items for sale including #pfsp warrior decks $45 and @portagesk8park t-shirts which are a hot item for only $5. Looking for some of these items well you can find them every day at Prairie Flower Beads Portage. 210 West cook street. Make sure to ask about our #pfsp wristbands and new vinyl decals for $5. A special thanks to Portage Parks and Recreation, Elements Boardshop Wisconsin Dells, Prairie Flower beads Portage and Kiwanis of Portage. Want to help further the @Portagesk8park visit Pizza Ranch Portage often during the month of June 2017 and 1.5% net sales will be donated to the #pfsp. You can also meet and great with us June 17th 2017 from 11-3pm @PizzaRanchPortage. We will be on site on September 9th from 9-3pm serving the best brats around once again so save the date and we look forward to seeing you there. Citywide Flea market days at the Columbia county fairgrounds Portage, Wisconsin for 2017. June 3rd and Sept 9th* from 9-3 pm. Come have a brat or hot-dog with us while looking for that diamond in the ruff.